Special effect technique is a screen and stage element that enhances a production. It ensures that the idea under consideration is well packaged, treated and gives the right interpretation and understanding as far as the audience perception is concerned. Buchman (1990) indicates that it is important as a makeup artist to understand the different techniques and approaches to makeup used in film and television as a strong base for professional work. Makeup is employed in film productions, theatre, television shows, still photography and as an everyday wear product by most ladies. No matter how free a woman becomes in mind, body or heart, her ability to alter and or improve her own appearance to her own taste will always be a source of intense personal gratification. Most people love their faces so much that, they cannot do without a mirror when setting their faces while dressing. One of the key accoutrements of ladies found in their hand bags are fanciful cute mirrors that puts their face in shape. Makeup is for both gender, but most often men leave this sweet craft for the ladies thinking it is a lady’s business. This is why ladies would look always young even at the age of sixty (60) to surprise the men. This element of enhancer puts confidence in the face of its wearer, so they say. The need to makeup actually compliments the attire you wear or the accessories draped on you. Somewhat, makeup puts one on an elegant pedestal ready to face intimidation. Most people presume makeup hides their shy stage and boost confidence. It might interest people to know that makeup is just a clear mask, because you can put it on any day and wash it off any time. It gives you the dual personality which our ladies dwell on to boost confidence, pride, beauty and poise. Even though the attires we wear can hide the deformities on the body, it can hide the blemishes and deformities on our face. In real life there cannot be makeup without an individual, likewise in the theatre there cannot be makeup without an actor, thus the actor is the main recipient of the art. Hence, the human face can be likened to a canvass on which paint pigmentation are applied. It is imperative to note the difference between special effect and visual effect in order to use both concept appropriately. Simply put special effects are carried out on set during production or by extension pre-design and completed on set. Meanwhile, visual effects are done in post-production modes, that is during editing of the recorded video (Corson, 1990). Special effect is applied in other forms; stage design, props and lighting design to mention a few. It is a craft that is very robust in presentation and application. The practice of special effect depends on how much additional skill you want to develop and how much time you are prepared to invest in the growth of the skill. 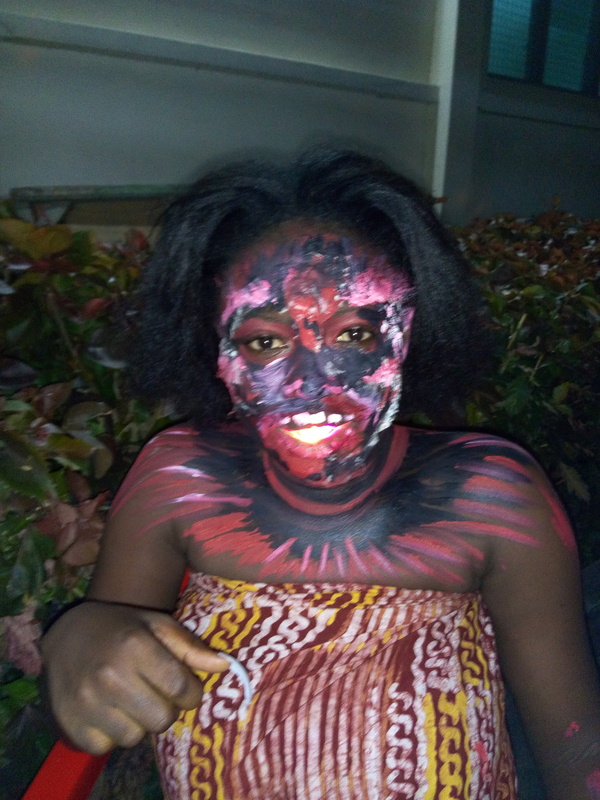 The output of special effect project by a makeup artist may largely depend on his/her experience, passion, ability to think out of the box and the love for research. In a given production, special effect can transform a young lady of twenty (20) years into a sixty (60) year old woman by the use of makeup materials; liquid latex, prosthetics, eye liners and foundations among others. Makeup can also achieve, bruises, black eye, scars, wounds, burns, distort human features and character images. A transformational makeup process was used to achieve the character, Subruku the giant in the production The Adventures of Sasa and Esi written by Martin Owusu and Directed by Johnson Edu a lecturer at the Department of Theatre Arts, University of Education, Winneba (UEW). The production was first performed by students of the Department of Theatre Arts (UEW), with Charles Harding playing the role of Subruku. The attach video gives a better insight into the output of special effect as an illusionary element. Unfortunately, the none availability of conventional makeup materials in Ghana, or where available, their high costs have resulted in our quest at the Department of Theatre Arts, (UEW) to identify and explore food materials and other non-conventional products in creating theatrical and film makeup for the teaching and learning process and for professional use. So the say, “necessity is the mother for invention.” For instance, some local Ghanaian dishes identified for makeup use, are fufu, banku, konkonte, akple, gari, kenkey, koko and bread flour among others. Undoubtedly, further research may reveal other resources for use, thereby expanding the horizon of local materials in the makeup industry. It is an undeniable fact that Ghana is richly endowed with natural resources which hitherto have remained untapped in several instances. Makeup presents one such situations according to Adjei as cited in (Aseidu, Collis, Gbormitt & Nii-Yartey, 1990). I would advocate that the teaching and learning of practical courses in the Universities in Ghana should provoke more practical research based projects balanced with theory in order to churn creative students to think out of the box to be problem solving oriented, develop their talents and have the flair for research in order to fill the existing gaps in practice and in the academia. Buchman, H. (1990). Film and Television Makeup. New York: Watson-Guptill Publications. Aseidu, M. Awo, Collins, J. E., Gbormittah, F., & Nii-Yartey, F. (Eds.). (2014). The Performing Arts in African Ghanaian Perspectives. Ayebia Publishing Limited. Corson, R. (1990). Stage Makeup. New Jersey: Prentice Hall, 1990.